This classic radio Microphone by Astatic brought big bids! 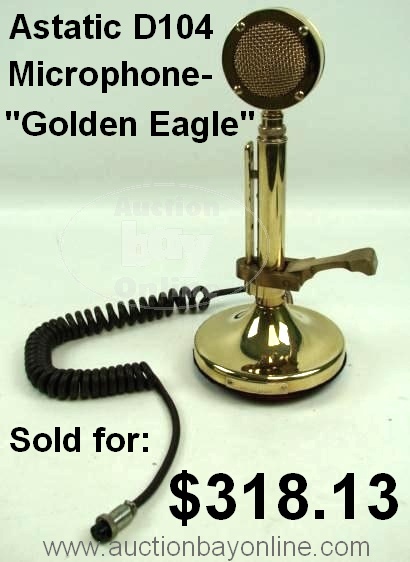 This vintage Golden Eagle mic by Astatic brought over $300 at Auction Bay! Auction Bay has recently had the pleasure of selling the largest run of vintage radios and radio parts & accessories that we’ve ever seen, and it’s still going! Thanks to a few consignors, we’ve had all manner of classic radio items, and this is just one example of the big sales from the collection. This microphone sold for a great price, and it’s easy to see why! This item is the Golden Eagle model D104 mic made by Astatic, in great condition. Its gold coloration puts a great look on a classic microphone style, and makes it highly collectible and very desirable among the radio enthusiasts out there. It can work for HAM radio operators, CB drivers, and even modern radio broadcasters, and will give an unmatched style to each venue! This one even had its manuals intact, so the bidders weren’t shy! We started the bidding at the standard auction price of $24.99, because we knew it would climb without a problem. 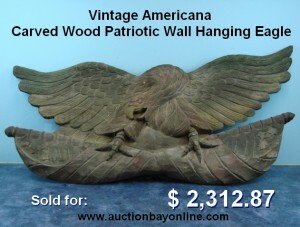 Sure enough, it got 22 bids and sold at $318.13! If you’re a collector of old radio items, make sure to check our other items for more great old radios! Or if you’ve got a collection of your own, we can certainly help you sell it! An Auction Bay sale out-classes the Jewelry Store once again! This Gold Coin Ring brought $322.05 at auction, over 2 times what the Jewelry Store offered! Here’s another Auction Bay success story, with a very satisfied consignor! Our consignor brought in this ring to see if we could manage a better sale price than she was offered by a jeweler. When she took it to a jewelry store for an estimate, she was offered a mere $150 for her item, and we were confident we could best that. The Ring was a curious piece, made of a 2 ½ Dollar Gold Coin built into a custom round setting. The coin itself was in good condition, showing plenty of detail, and the ring did a great job of framing the coin, so it had the benefits of three kinds of value: numismatic (a collectible coin), intrinsic (a handsome piece of jewelry), and actual gold value. We listed it to show off all three of those, and our methods led to a sale of $322.05! That’s over two times what the jewelry store offered our consignor! We encounter this pattern often. A jeweler will offer you an amount for your gold which still allows them room to make a profit when they re-sell an item. This is understandable, as they have expenses to cover, but it still leaves you wanting for the rest of your gold value! In the case of scrap gold, they have to take that gold, melt it, fashion it into new jewelry, and then turn a profit on top of that. But when we at Auction Bay sell gold for you on eBay, your item will always sell for its gram weight value or higher! We take specific measures to ensure that your gold gets sold for the greatest possible value that the market will bear, because the only way that we make money is if you make money. If you want to learn more about our process, check out our Coins & Gold page for more information. Auction Bay offers you the best and safest method to convert your gold into cash. 2 Eagle 1 Spaceships by Mattel from Space: 1999 really took off. Jason here, with an item to share. First, I must offer a confession. I’m a geek. Yes, I am an absolute geek… a fan of sci-fi and kung fu movies, with my own small collection of little plastic spaceships. These toy Eagle-1 spaceships sold on ebay for $325!! 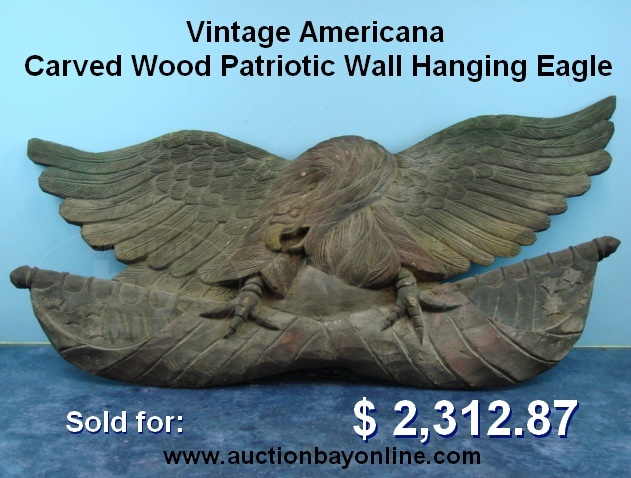 So it was no surprise to me when this item began to get bids, but each of us at Auction Bay were floored to see how well it sold! This auction was for a pair of toys, one played-with and one new-in-box. These toys, made by Mattel, replicate the Eagle One Spaceship from the science fiction epic SPACE: 1999. The toys date to the 1970s, and are fairly sought after by people like me. So sought after, in fact, that these two toys sold on eBay for a whopping $325.00! Yessir, we geeks love models and toys that remind us of our childhood, or which simply look cool! We’re willing to dump loads of cash on items like this, so if you happen to have some old toy space ships or laser pistols or action figures or other toys from any old sci-fi or fantasy movies or series, don’t be quick to toss them or donate them! Instead, bring them into Auction Bay and we’ll check to see their potential value. You never know when that old toy could be just what we want to buy!